Laparoscopy plays an important role in penetrating injury (2,4,7,9,11-22). In the absence of such findings, hospitalization may be unnecessary. Specifically, in patients who sustain thoracoabdominal wounds, diagnostic methods such as peritoneal lavage, ultrasonography, and computed tomography scan are not as accurate nor as helpful as laparoscopy in ruling out penetrations, allow. Laparoscopy for visual inspection of the diaphragm, evaluation of hepatic and splenic lacerations, and even identification of pericardium for possible hemopericardium, as well as anterior abdominal wall injury evaluation (7,11-13,24). Laparoscopy is helpful in the tangential gunshot wound, where there is a concern for intra-abdominal injury. Should peritoneal penetration be ruled out via direct visualization utilizing this technique, further hospitalization of such patient is unnecessary. Laparoscopic management of selected abdominal gunshot wounds can be accomplished without morbidity (7,12,13,16-18,25). Such benefit extends to selected patients with missile wounds of uncertain trajectory through the peritoneal cavity. Zantut et al. reported that 58% (113 of 194) of stable patients with gunshot wounds, who were evaluated with laparoscopy, were discharged home with confidence after a brief hospital stay without the need for laparotomy (9). Laparoscopic management of penetrating chest injuries has also been described. Laparoscopic evaluation of 110 patients with a penetrating wound to the left lower chest was described by Murray et al. in 1997. Importantly, all the patients were hemodynamically stable and without other indications for a celiotomy. Overall, 24% of the patients sustained a diaphragmatic injury (26). Spann et al. found in 31% of the patients, where a hemo- or pneumothorax was identified on chest X-ray, a diaphragmatic injury was later identified by laparoscopy. Some of these injuries were repaired laparoscop-ically, and others were repaired after conversion to celiotomy (27). Diaphragmatic injury from penetrating trauma has also been evaluated utilizing thoracoscopy. Ochsner et al. and Uribe et al. found 9 out of 14 (64%) and 9 out of 28 (32%), respectively, of their patients with penetrating thoracoabdominal injury to have a diaphragm injury. In all of the above described patients, thoracoscopy was deemed to be a safe procedure (27-29). A debate exists as to the preferred mode of approaching diaphragmatic injuries. Specifically, in patients who sustain thoracoabdominal wounds, diagnostic methods such as peritoneal lavage, ultrasonography, and computed tomography scan are not as accurate, nor as helpful as laparoscopy in ruling out penetrations, allow. Laparoscopy for visual inspection of the diaphragm, evaluation of hepatic and splenic lacerations, and even identification of pericardium for possible hemopericardium, as well as anterior abdominal wall injury evaluation. Laparoscopic management of penetrating chest injuries has also been described. Proponents of laparoscopy argue that the incidence of associated abdominal injuries for penetrating thoracoabdominal injuries is significant enough to warrant an evaluation of the diaphragm and the peritoneal cavity simultaneously. Furthermore, the utilization of double lumen intubations, which carries its own risks, is avoided. Those who favor thoracoscopy argue that this technique avoids insufflation pressures utilized with laparoscopy, which are associated with pneumothorax and hemodynamic changes. It is also argued that this technique is able to avoid violation of the peritoneal cavity in patients who do not have a diaphragmatic injury. 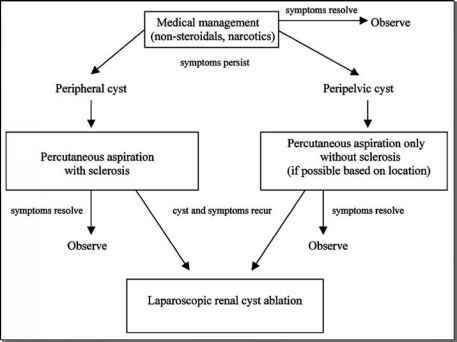 Guth and Pachter evaluated 70 patients with penetrating abdominal or lower chest injuries with laparoscopy, yet found two patients who subsequently underwent thorocotomy, suggesting that when laparoscopy is utilized primarily, significant intrathoracic injuries may be missed (30). Different techniques for laparoscopic evaluation of the peritoneum are described, one such approach includes initially placing a 5 mm scope 4 cm above the umbilicus (port 1). Two additional 5 mm ports are placed, one in the suprapubic region (port 2) and a second in the region of the midline (port 3). The peritoneal cavity is inspected for blood or bile. Upon completion, the scope is moved to port 2. Utilizing atraumatic bowel graspers, the bowel is "run" from the ligament of Treitz to the ilium (9). Importantly, a missed bowel injury including perforation is a potential fatal complication. So, laparot-omy must be performed in patients where any doubt of injury remains (22,23). Computed tomography scan is the mode of choice in evaluating the hemo-dynamically stable patient with blunt trauma.